Today’s Street Law Clinic at Joan Macy School is populated by some of its juniors and seniors. 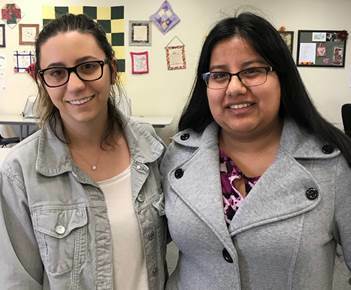 Shuffling through papers are May Doron and Sandra Lopez from Southwestern Law School in Los Angeles, who look young enough to be in the class themselves, rather than the second-year law students who are teaching the class as part of their own coursework. They are wearing casual clothes, not courtroom worthy power suits. Today’s session starts with a multiple-choice survey designed to help students identify their interests with an eye toward future employment. The teens start to giggle over the either/or options. “Circle the ones you like best,” instructs Lopez. “What if you don’t like any?” comes the inevitable reply. “Then circle the ones you dislike least,” she says with a laugh. She and Doron take it in stride; they’ve been teaching the Street Law Clinic for a few weeks now and have developed a rapport with the students. The Street Law Clinic is just one of the classes offered by Joan Macy School. A diploma granting, certified non-public school recognized by the California Department of Education, Joan Macy School offers a unique special education program for students grades 1-12 who require more intensive support in accordance with the Individualized Education Plan (IEP). The Street Law Clinic has been offered since 2008 to help students understand how the law will affect them as adults. Professor Cohen notes that many former Street Law participants have gone on to work in public service and education, and Lopez may follow in their footsteps. “I hope to one day work with the federal government, but I am interested in doing pro-bono work with low income families in the future,” she says.